Jade Jones, of Britain, celebrates her victory over Eva Calvo Gomez, of Spain, in the women's 57-kg taekwondo gold medal match at the 2016 Summer Olympics in Rio de Janeiro, Brazil, Thursday, Aug. 18, 2016. 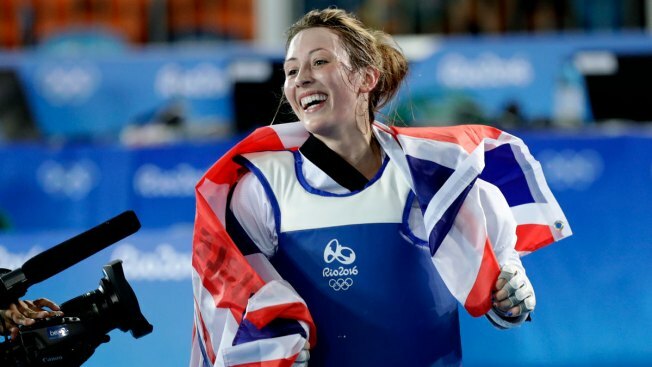 Britain's defending taekwondo champion Jade Jones hung onto her title. Jordan's Ahmad Abughaush gave his country its first Olympic medal with a surprising run to the gold. In an action-packed fight Thursday, the top-ranked Jones used an almost continual stream of aggressive attacks that Spain's Eva Calvo Gomez was unable to counter in the women's 57-kilogram division at the Rio Games. Jones won 16-7. Jones scored two head kicks within seconds of each other during the first round for an early lead that she never relinquished. The 20-year-old Abughaush won in the men's 68-kilogram division, defeating Russia's Alexey Denisenko. The top-ranked Jones, 23, took the gold medal at the London Games and also won the European championships in May. On Thursday, Jones dominated all of her opponents, often scoring first off her lightning-quick front leg, before hopping toward her opponent while throwing repeated head kicks. Her British teammates have nicknamed her "the headhunter" for her trademark move. "It's unbelievable," Jones said afterward. "I knew I wanted to be a legend after London. This proves it wasn't just a fluke." After her victory, Jones brought her coach onto the mat to celebrate before the two posed for pictures with the flags of Britain and Wales. Gomez, seeded second, won a silver at last year's world championships. She and Jones are longtime rivals and have often split major taekwondo competition victories between them. The women's bronze medals were won by Egypt's Hedaya Wahba and Iran's kimia alizadeh Zenoorin. Abughaush's victory wrapped up a surprising day of upsets. In a nail-biting final, Abughaush landed several jumping head shots that elicited gasps from the audience. Abughaush beat Denisenko by a score of 10 to 6. Abughaush's success was closely watched back home — much of Jordan's royal family stayed up to watch his historic run at the Olympics. Soon after he received his medal, he got a telephone call from the King's brother, Prince Feisel al Hussein, president of the country's Olympic Committee. "He told me that the people of Jordan are very happy and crying tears of joy for me," he said. Abughaush said he was very happy to be able to win Jordan's first Olympic medal. He acknowledged his rather unorthodox style, saying that while he and his coach had plotted out how to fight certain opponents, certain moments on the mat were "improvised." He said he would celebrate his gold medal by going out with other Jordanians in Rio and by singing with them. Earlier in the day, the 10th-ranked Abughaush knocked out second-seeded Lee Dae-Hoon of South Korea before eliminating Olympic champion Joel Bonilla Gonzalez of Spain, who won the 58-kilogram division at the London Games. Lee applauded Abughaush's performance after being beaten by him, raising Abughaush's arm in victory when he was announced the winner. Denisenko knocked out Turkey's defending Olympic champion Servet Tazegul before defeating top-ranked Jaouad Achab of Belgium. 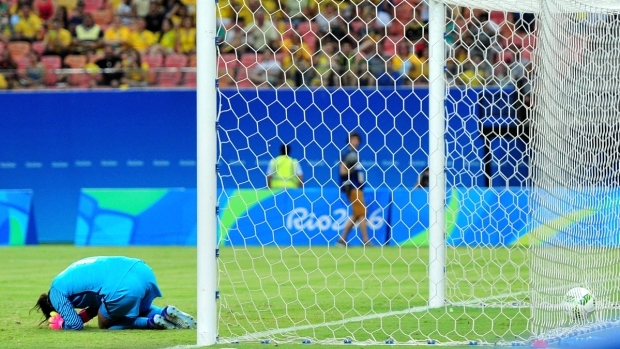 The men's bronze medals were won by Spain's Joel Bonilla Gonzalez and South Korea's Dae-Hoon Lee.